Heat press machines use a heat transfer process to print designs on pretty much anything. They are mostly used for printing on apparel, though. You can print designs on t-shirts, pants, bags, flip flops, hats, and even sneakers. The apparel market in America is expected to grow to an estimated value of $385 billion by 2025, so if you're in the apparel business, you should get yourself a heat transfer press machine. There are a few different types of machines, and Instagraph makes specialty heat presses that you can't get anywhere else. These specialty heat presses are designed specifically for their functions, so they will work wonders for your custom projects. This heat transfer press has been engineered to press transfers for hats and caps. If you tried to print on a hat or cap with a different press, it might not come out very well. These machines are great for sports teams looking to print their logo on their hats. They are also great for a custom gift to dad or grandpa this Father's Day. 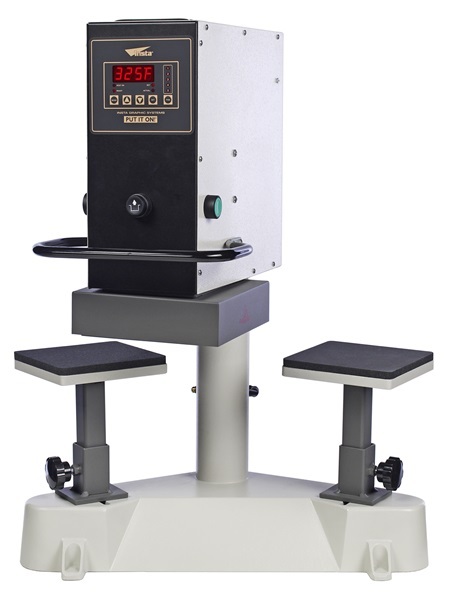 The dual station heat press was made to accommodate the growing heat transfer industry. This press gives you two stations, so you can get twice the amount of productivity without sacrificing consistency. These presses are great for those who own custom apparel businesses that get a lot of orders in. They also work well for anyone looking to print things quickly and efficiently. The single station label press was also designed for the label industry. However, the difference is that it has a foot pedal operated allowing the user additional hand dexterity and consistency with graphic and label positioning. This means the fine motor skills and coordination of the small muscles in your hand can work much better when using the single station label heat press, which is necessary for consistent work. Instagraph sells specialty heat presses that you can't find anywhere else. You can get a hat press, a dual station press, and a single station label press, all to suit your specific needs. For more information, give us a call today.